This is the first Czech edition of A Thief of Time. This 2003 edition was published by Paseka in Prague, Czech Republic. Tony Hillerman's original English text was translated into Czech by Luba Pellarová and Rudolf Pellar. 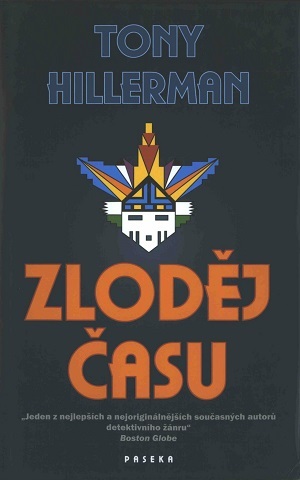 This appears to be one of three Hillerman books published in Czech. The cover art is not credited but it features a geometric brightly colored stylized mask. Format: Hardback, 20.7 x 13.5. Binding: Deep dark blue hard boards with the title, author, and publisher printed both on the spine and on the front cover.